Kerrits sprouted from humble roots. The journey began when founder Kerri Kent took $50 and her passion for windsurfing to the fabric store in hopes of designing a swimsuit for women that would stay in place. With no money to spare, her patterns were made from paper bags and her fit models were local windsurfing friends. Once sewn, Kerri took her suits to the beach and sold them out of her gear bag. As Kerrits grew, so did our reputation. In 1991 The Oregonian wrote a feature on Kerri and the unique windsurfing inspired designs by Kerrits. Shortly after, a similar article appeared in The New York Times, mentioning Kerri’s wish to expand into another of her passions - creating a performance apparel line for women who rode horses. The article intrigued the CEO of Eisers, a well-known equestrian company. He called and asked Kerri to design a line for their On Course brand. A simple pack of carrot seeds for the hangtag, and Kerrits Performance Equestrian Apparel was born. Just like the swimwear line, the equestrian line gave women something they craved: functional clothing that looked great too. Up until then, equestrian wear was traditional in fabric and styling. 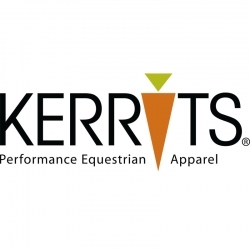 Kerrits featured performance fabrics, brighter colors, and new styles never seen in equestrian fashion. We used our database of women’s measurements for a guide in finding the perfect fit that not only performed, but also flattered. It started out as a small line of just five coordinating pieces. From there, the brand took root. We offer hundreds of items, but you can still find our signature Houndstooth Performance Tight in retail stores today.